Tomato based curries are very common in north Indian homes and probably the easiest to pull off as a tomato based curry is quite forgiving. Very very versatile as well. There can be a butter/makhni gravy with tomato base and there can be a spicy gravy too. And there can be a bong style tomato based curry that I learned from my friend Rita Sinha almost a decade ago. I had started eating fish recently and would ask for new ways to cook fish to each and everyone known. 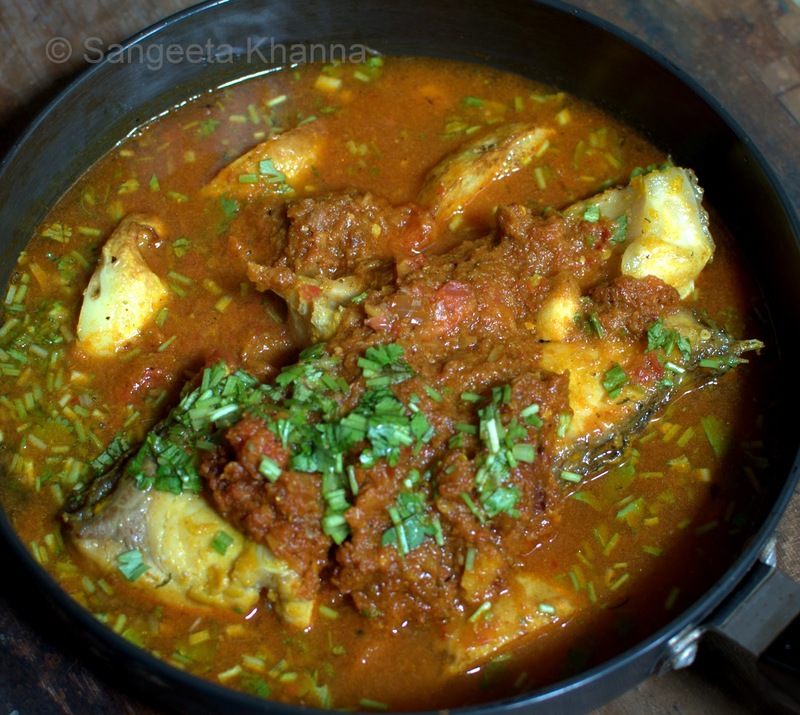 This one was one such fish curry I learned during the time that is repeated quite frequently till date. Especially when I have the best quality tomatoes and fresh green coriander leaves in the fridge. 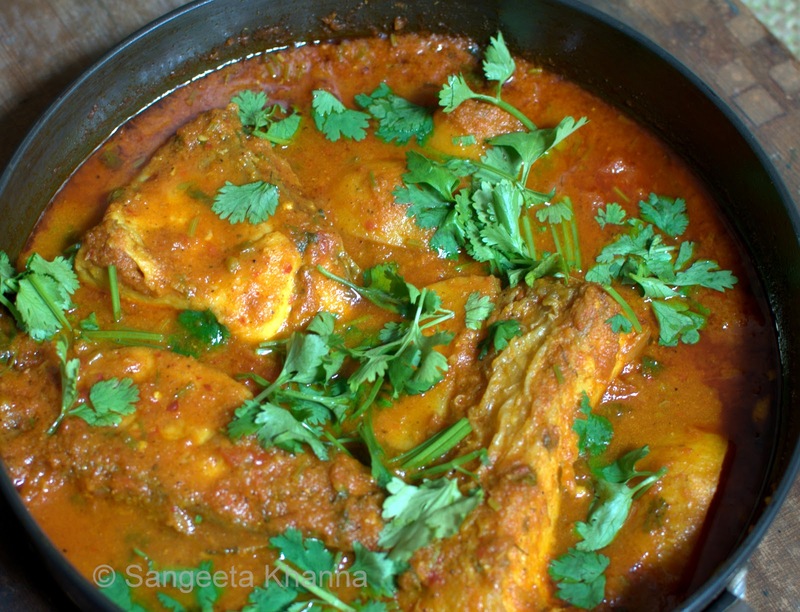 Slightly tangy and aromatic with fresh coriander greens, a thick gravy that is mildly hot. My addition to the curry is chopped stems of coriander greens during the final simmering, adding a really fresh dimension to the flavors. This tomato gravy fish is best enjoyed with rice and tastes best when the fish steaks are big. A fatty fish with skin and bone is what you are looking for. Large fillet would also work. Heat the mustard oil in a large kadhai. Fry the fish steaks lightly in mustard oil and place the quartered potatoes on the side too so they get browned as the fish steaks get fried. Drain and transfer the fried fish and potatoes to a flat base frying pan, or another kadhai. Pour the onion paste into the remaining oil first and fry for a while. Till the mixtures starts getting pinkish in color. Add the salt and ginger-garlic-chilly paste. Fry till the oil separates or the mixtures gets glazed. Add the powdered spices and mix well. Cook (bhuno) tll the spices get lightly aromatic. Add the tomato paste and again bhuno till the tomatoes change color and get glazed again. Pour this cooked spice paste over the fried fish steaks in the other pan. Sprinkle the chopped stem parts of the coriander greens. Cover and let it simmer on low flame slowly for about 20-15 minutes. The oils will float atop the gravy and the coriander stems will be cooked and aromatic, lending the curry a nice flavor. This final simmer is the essence of this curry, all the flavors are evoked in the presence of this fresh coriander stems tha are added in this step. So don't skip it. Garnish with coriander leaves when cooked and serve hot with plain boiled rice. Boiled rice is the only accompaniment that this curry needs, that too in minimal amounts. The gravy is thick and rich with flavors of tomatoes and coriander greens. The spices are subdued and mild but he chilly and peppers shine through, complementing the tang of the tomatoes well. 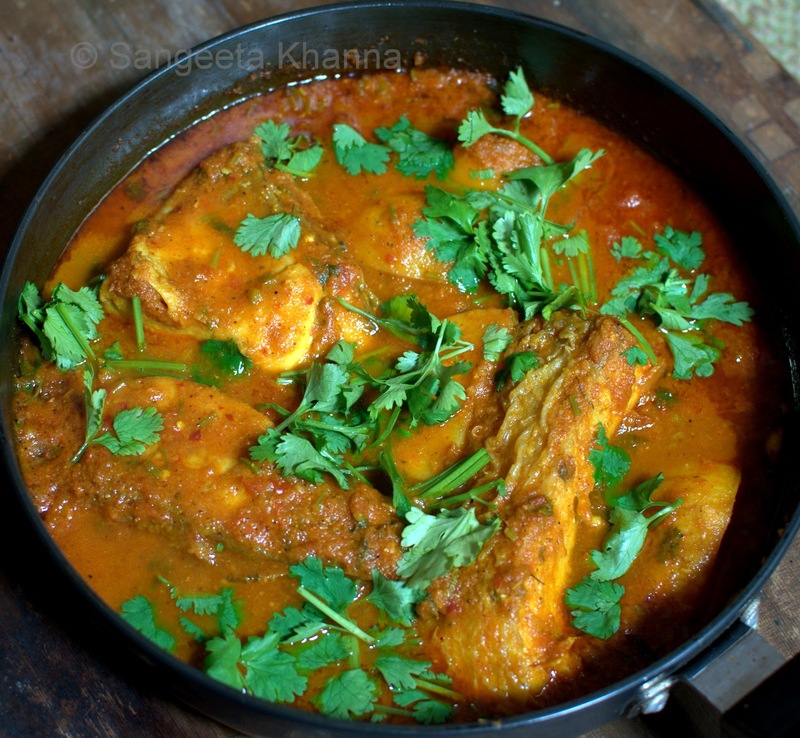 This is the fish curry you would like with minimal rice, just the soupy gravy and the fish steaks make you meal filling and satiating. My kind of meals when rice or roti is incidental. Tamatar waali machhli it is, but the coriander greens are as essential for the flavor of this particular curry. The same gravy works well for paneer and eggs as well. 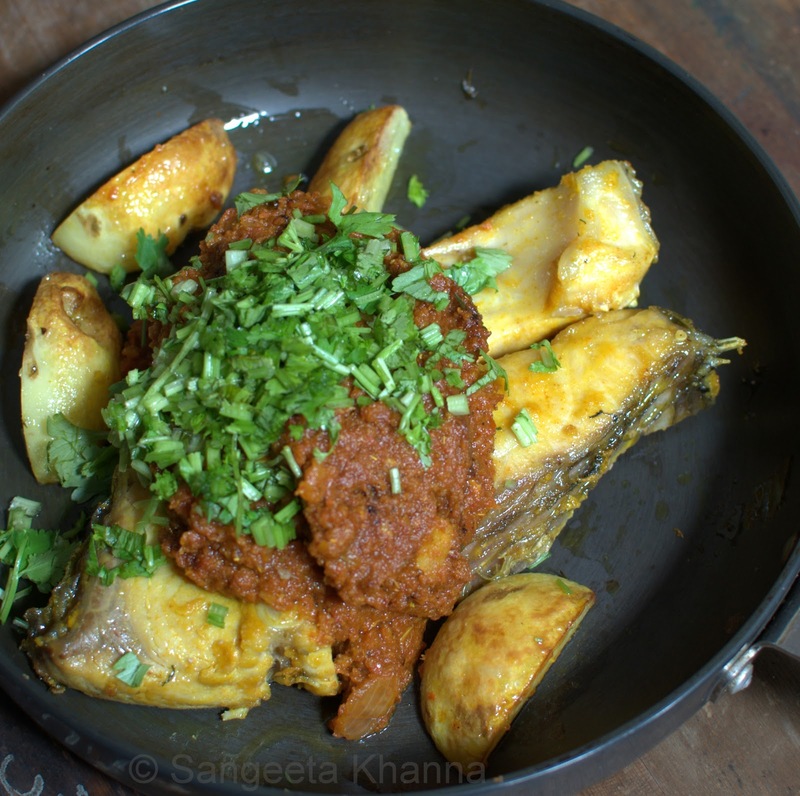 The fried wedges of potatoes are treated well in this curry too. Actually anything that cooks within 10 minutes when this curry simmers after bhunoeing the masala paste. Those 10 minutes of simmering give this curry all the flavor. Very tempting and yummy macchi gravy.